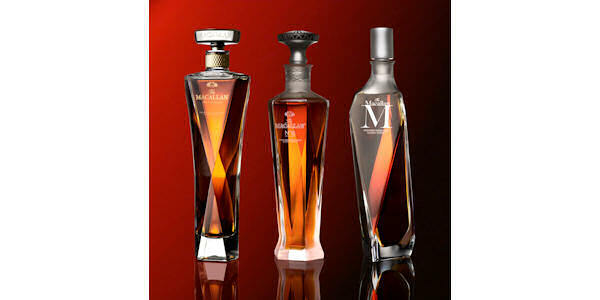 The Macallan, the world’s ultimate luxury single malt whisky, has unveiled The 1824 Masters Series featuring two stunning decanters. The range,including Reflexion and No.6, features the finest single malt, 100% sherry seasoned in oak casks. The Macallan’s Master Whisky Maker expertly crafted the whiskies to showcase the signature style of The Macallan and honour the beautiful spectrum of natural colour unique to this exceptional single malt. Sitting atop Ruby within the current 1824 Series, these striking new decanters, each one magnificent in status and appearance, will carry whisky connoisseurs through the range to the crescendo of M, the halo of the entire series and the world’s most valuable single malt whisky. This collection of exceptional single malt whiskies becomes increasingly dark and alluring, increasing in complexity as the chosen casks themselves become scarcer and the range progresses from Reflexion to No. 6. This is testament to The Macallan’s Master Whisky Maker’s, Bob Dalgarno, meticulous selection of the most exceptional sherry seasoned oak casks. Taking inspiration from The Macallan’s iconic triangle and the desire to showcase the whiskies stunning natural colours, the exquisite style and design of each decanter beautifully showcases the peerless spirit which defines The Macallan. The Macallan Reflexion (43% ABV, £900) is a reflection of the foremost influence of first fill sherry seasoned oak casks, drawing its colour and flavour from maturation in hogshead casks. These are smaller casks which allow for greater surface area of wood to interact with the spirit to deliver an intricate character driven by the influence of both Spanish and American oak casks. Sculpted through the inspiration of The Macallan’s iconic triangular shape, Reflexion is a masterpiece both in style and stature. Its exquisite angular facets each reflect the light to showcase the deep red mahogany hue of the whisky within. The depth of the colour and the complexity of flavour of Reflexion derive from the casks selected for this distinctive expression by the Master Whisky Maker. Bold and full-bodied, Reflexion is a celebration of floral and vanilla notes, punctuated with fresh apples and apricots. The Macallan No.6 (43% ABV, £2,800) brings together the art of The Macallan Master Whisky Maker with the exquisite craftsmanship of Lalique resulting in a piece of timeless elegance. Exclusively designed and crafted for The Macallan, this flawless crystal decanter pays homage to the single malt’s heritage through its use of triangular facets representing the Six Pillars, incorporating the iconic triangular feature as a key element of its creation. The classically beautiful Lalique decanter encases complex single malt made using only first fill Spanish sherry oak casks from a single Jerez cooperage. The beautiful design enhances the enticing, rich dark walnut colour of a classic Macallan character, a celebration of richness, spice and dried fruit with a layer of heady orange groves. The Macallan 1824 Masters Series is a stunning collection of whiskies created to showcase the beautiful range of The Macallan’s natural colour. As you move through the collection, each expression becomes increasingly dark and more complex, reflecting the careful selection of exceptional casks. The interaction of spirit and wood alone delivers the beautiful range of rich, natural colours that distinguish The Macallan whiskies.